"Love your enemies and pray for those who persecute you, that you may be sons of your Father in heaven. He causes his sun to rise on the evil and the good, and sends rain on the righteous and the unrighteous. If you love those who love you, what reward will you get?" It is easy to affirm the humanity in those with whom you share your own humanity, with those who, by word or deed, have loved you and have affirmed your humanity and your way of life. But it is more difficult to love the people with whom you seemingly share no identity, the people who have threatened your way of life, and those to whom you wish to destroy or exterminate because they have either wronged you or have shown themselves to be against you. It is difficult to call your enemy a brother or a sister but Christ has called us to do just that. Therefore love is a journey toward all the wrong kinds of people. Love eventually leads us to whomever it is that we do not or simply cannot love. It compels us to find humanity and brotherhood with those who we are inclined to hate. This sort of love cannot be done from a comfortable vantage point and it cannot be done from a distance, we must experience humanity with the other in order to affirm it in them. When we step outside ourselves to love the unlovable, we may likely disrupt and even enrage those who are comfortable in themselves. When our humanity begins to be shared with others we offer an alternative and a challenge to those who are not willing to share theirs. When someone who identifies with me sees me identifying with their enemy, they are likely to be at least a bit frustrated and hopefully challenged. For example: Would most Americans be unsettled at he thought of entering into solidarity with Osama Bin Laden? Therefore if an American expresses any affirmation of Bin Laden's humanity they are likely to make some more enemies (which means just more people to love). Or, for a less extreme example, if a Republican affirms the humanity of and shows support for a Democrat they are likely to make some enemies. Therefore, love is about breaking boundaries--boundaries between Jew and Gentile, slave and free, male and female... Arab and American, legal and illegal immigrant, gay and straight, rich and poor--and it is about being invited into and united in one humanity, the Body of Christ. Saint Paul wrote, "There is neither Jew nor Greek, slave nor free, male nor female, for you are all one in Christ Jesus" (Gal. 3:28). This is a lesson I learned from Peter Jackson... from the movie "District 9". 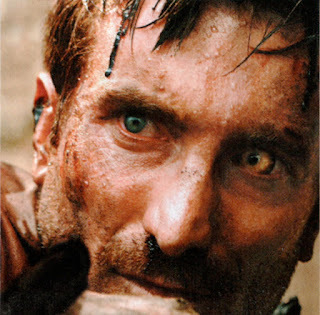 The hero Wikus van der Merwe (played by Sharlto Copley) shares (literally) no humanity with the aliens who have mysteriously inhabited his planet, the planet Earth. His mission is to forcefully relocate the aliens from the homes they have created to a sort of quarantine camp, almost like a concentration camp. He feels no remorse for the death and/or mistreatment of the aliens because to him they're like insects... that is until he is forced to share his humanity and his identity with them. As he slowly assimilates, he leaves home and family as the people who once shared with him become his enemies and the people (the aliens) who once meant nothing to him become his brothers and sisters until he eventually risks everything for them, affirming the humanity of those who were formerly insects in his eyes. "no one who has left home or brothers or sisters or mother or father or children or fields for me and the gospel will fail to receive a hundred times as much in this present age (homes, brothers, sisters, mothers, children and fields—and with them, persecutions) and in the age to come, eternal life." The life to be found in love and in solidarity far exceeds the emptiness of life in the prison like walls of discrimination, hatred, and apathy.